This year (2008) I am planning to have a "cold-weather" open house with a Christmas theme, my first ever. This is second in a series of notes on my progress and/or lack thereof. Solid red, purple, blue or yellow on the other trees. Brought out buildings and trains with Christmas themes. 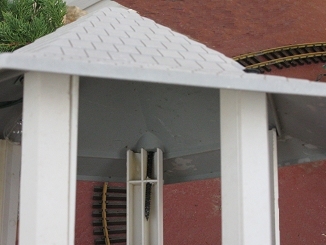 Put a circle of track on the deck, with Thomas, buildings, and fake trees. I have a row of Emerald Green Arborvitas along the west (back) edge of my railroad. Hopefully they will one day grow large enough to obscure the privacy fence and make a nice natural backdrop. In the meantime, they are mostly cone-shaped, so lighting them will make them look a little like a row of Christmas trees. I also have many miniature conifers on my railroad, including Dwarf Alberta spruce, which also mostly have a cone shape. Power Distribution - Over the years, I've picked up several of those yard stakes with the outlets in them, and a couple heavy-duty timers with multiple outlets. I plugged a timer in and ran a yard stake/power feed from it. I then ran another yard stake/power feed from the first stake, in what engineers used to call "daisy chaining." I doubt that "daisy-chaining" these is recommended, but I tried to avoid overdoing it. I have never needed to distribute "serious" 110-volt power to my railroad before, since the track and the few buildings that were lit use low-voltage. And I didn't really have time to do it "right" this time. But using the little power stakes helped me avoid the trap of wiring too many stands of Christmas lights in series. Getting Wired - I started out wiring the row of arborvitas with the many strands of blue lights that my wife's Aunt Anna left behind when she passed away early this year. Shelia thinks that Anna would be tickled that we found a use for them. 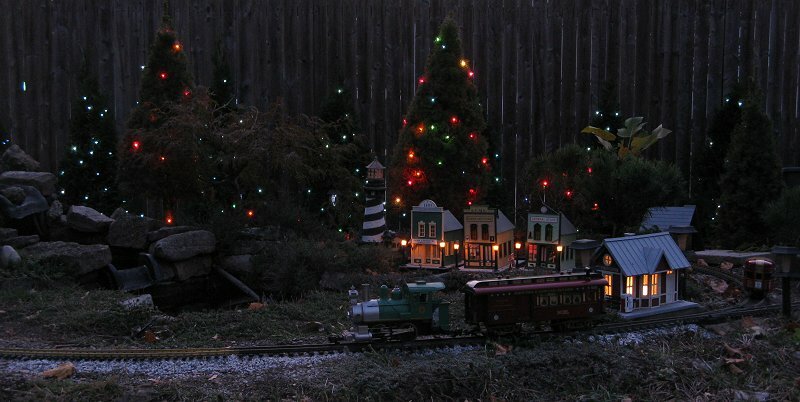 Again, although you CAN "daisy chain" strands of Christmas lights, plugging them into each other, using the yard stake/power supplies allowed me to avoid plugging more than two strands in a series over most of the railroad. When the big job of wiring the arborvitas was done, I worked piecemeal, in between other projects, lighting the other trees with multicolored lights. At the moment, a few clusters of trees are still unlit. But using a blue backdrop with brighter colors up close seems to add depth to the setup, and it is pretty when it's all lit up. When I got the sockets home, I soldered short lengths of wire to all of them. That way, when I wanted to light one of my buildings, I could just screw the socket to something and be ready to go. 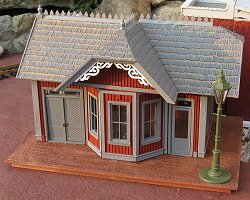 An AristoCraft "Victorian Station" that I bought used through Ebay and which came to me in pieces because the first owner had used cheap glue. 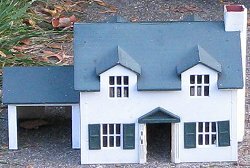 In 2007, I repainted it with slightly different colors (I thought the original base coat was too purple) and started reassembling it. The roof on this is a bear to assemble, especially if someone else has already gunked it up with bad glue. Nowadays these stations come prebuilt from China. If you have the option, pay the difference and get the built-up version. 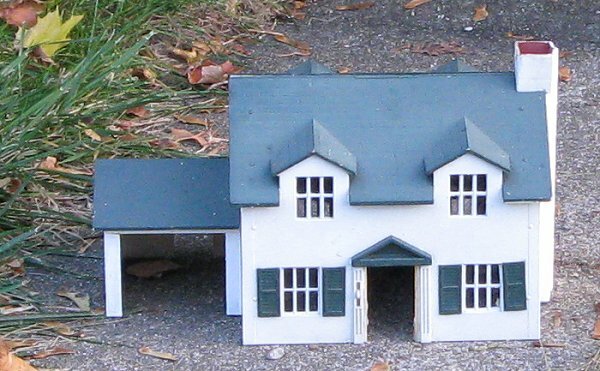 By December, 2007, after multiple stages of gluing a few pieces together at a time and letting them dry until I could get back to the project, the building was mostly assembled. So I glued the building's walls to the base, attached a lamp base for a wedge-type landscaping bulb, glued on an LGB streetlamp that the fellow had sent with the thing, wired those two fixtures together and set the station near the railroad. 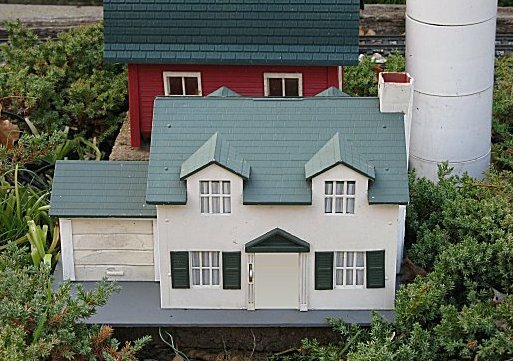 A Cape Cod house that had been converted from a Fisher Price family home. 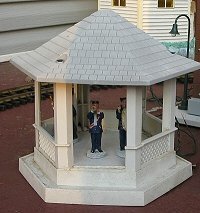 I had painted this structure and put in details like windowframes and shutters several years earlier, but I left it sitting on its Masonite base. The base had deteriorated to the point where it would no longer hold the building together, and most of the white paint was peeling off of the wooden ends of the building. The ends are made of actual boards so they were in pretty good shape, although the paint had peeled off. I repainted the ends. Then I replaced the masonite base with a plexiglass base that was painted with gray primer. I didn't screw the base completely into place until I was finished with the next step, though. 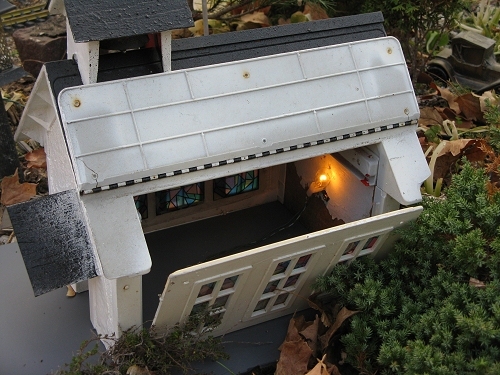 I wanted to put a light into the house, too, but it is gross inside - the paper that was inside when it was a sort of dollhouse has curled, molded, discolored, and been chewed by mice. So I didn't want folks looking right into the windows. I found some leftover "curtain paper" from a Piko kit and used that. I used glue to attach the paper, then realized that was probably dumb, because the curtains will probably yellow and need replace later. So I used electrical tape on my subsequent projects. Finally, I screwed a wedge-lantern base into one of the wooden end walls, popped in a bulb, ran a wire out through a hole in the new base, and screwed the base on. 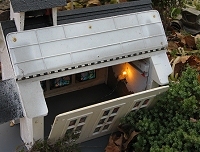 The photo to the right shows the house with curtains installed, on its plexiglass base. It is sitting on a 2x8x16" steppingstone, waiting to be "backfilled" with gravel. The flat ground I used to set this on has been overtaken by a Dwarf Procumbens Juniper (which spread sideways), and I didn't want to mess with trimming the juniper back this week. A church that had been converted from a Fisher Price schoolhouse. 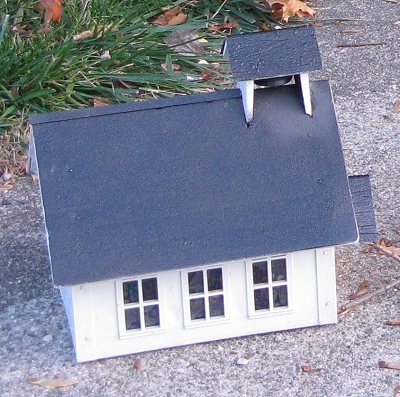 Like the Cape Cod house, the shoolhouse/church had a Masonite base that had thoroughly deteriorated. The ends of this structure are pressed wood. They have taken on moisture and swollen up, but they haven't caused the building to deform yet, so I thought I would work with them another year. The photo to the right shows the church before the base was reinstalled. It falls apart without a base, so using it like this wasn't an option. Before I installed the base, I attached a socket for a wedge lamp. Since I had already made "stained glass" windows on my computer, using a transparent plastic printing paper and the Stained Glass Window pattern from my Free Graphics page, I didn't have to worry about curtains. Then I tested the light to make certain it shown through the stained glass windows - it did. Finally I put the base on and set it in place on my railroad. 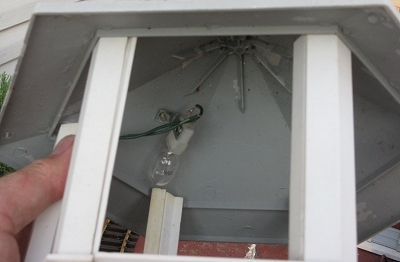 The photo to the right shows the wedge lamp and socket in place. 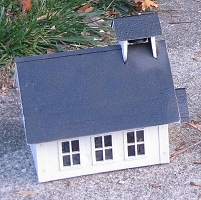 This building comes with a hinged roof that I left intact when I trashbashed it. A Gazebo that I trashbashed from an Artline bird feeder. To create this structure, I took the feeder apart, turned the middle section upside down and cut it to an appropriate height (discarding the "deeper" bit of lattice, which was too deep to make a Large Scale wall). I cut one "wall" out of the fence, to create an entrance. Then I used a bit of fluted plastic sign material for the floor and caulked it with white caulk to fill the gaps. The original paint job has mostly worn away, and one of the "pillars" has cracked, but it's held up otherwise. I never installed lighting or really fastened the roof down until this month, however. After "agonizing" about how to attach my wedge socket, I gave up and used the tiniest self-tapping screw I could find. It makes a "bump" in the roof but I'll replace it and file out the bump when I have more time. I also fastened the roof down by predrilling starter holes through the "brace" that strengthens the wall part and shooting drywall screws down through it (yes I know they're not rated for that, but they were the right size). If I have time and decent weather, I'll touch up the roof with gray primer (which will help camouflage and somewhat protect the drywall screws) and touch up the base with flat white. 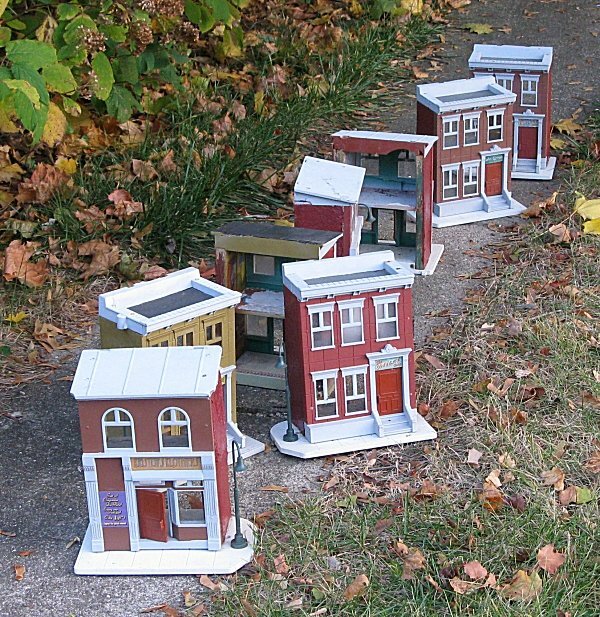 At the same time, I got my Fisher Price buildings out and decided that, in spite of their problems, they should hold up a few more weeks outside. 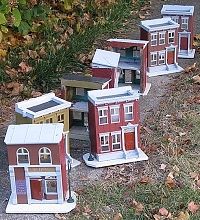 The plastic parts I painted were still in remarkably good condition, and that was the only part most folks would see. But rehabilitating those will come under the next article. Still to Go - Here are some things I'd like to get done in the next week. What do you think? Yardwork raking the yard, getting the leaves off of my railroad, etc. Pond work - cutting back the pond plants and otherwise getting the pond ready for winter. Running the rest of the Christmas lights - I have a few stands of trees that are not illuminated yet. Rehabiliting remaining buildings - Depending on how you count them, I have between two and six more buildings that I could theoretically get ready for the open house. Placing and lighting remaining buildings - Not only do I have to get Louis' buildings established in their "final" location, I also have to establish some kind of foundation and lighting for any other buildings I add. Building Thomas' Railroad - Last year I built a portable Thomas the Tank Railroad as part of a series of garden railroading clinics for Holden Arboretum. I wanted to set that railroad up, too, but Thomas' trestle got smashed up in the garage, and I won't have time to rebuild it. So now the plan is to set Thomas' railroad up on the well cover, a 5x5 concrete slab against the back of my house. So all in all, there's not THAT much on my plate in the next two weeks . . . It's easier if you do a thorough job in the first place and stay on top of things. What I haven't mentioned is the structures that didn't need significant rehabilitation for this project, including the New Boston station that you can see in front of the pond - it hasn't been repainted since 2002 and is still in great condition. In the cases that have held up, I used only plastic materials and at least two coats of appropriate indoor/outdoor spray paint. There's nothing like an open house to get you busy with tasks you've been putting off for five years. I was hesitant to do some of those tasks for fear of making a mistake, but letting things go undone for years is a mistake, too. 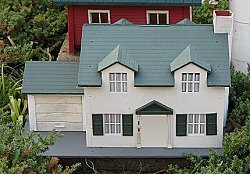 If you do get to an open house at my railroad, you will be seeing most aspects of the railroad in the best shape ever. 'Nudder Note about Christmas - As we mentioned in our first installment, part of our reason for doing all of this rework and setup is to make Christmas a little more cheery for our family, friends, and readers. 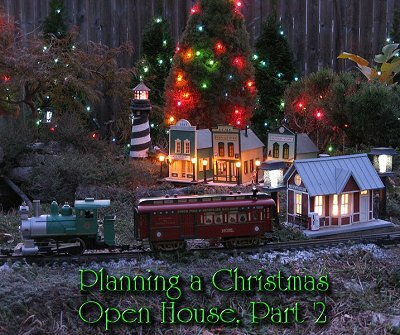 I hope that detailing all of our "trials and tribulations" as we prepared our railroad for an open house this year doesn't discourage you about the things you need or would like to do, either for your railroad or for this Christmas season. [Actually, I'm writing this note after the open house, and I can promise that it really does come together, mostly.] Rather, we hope that these articles give you ideas and encouragement for your own projects, and that they also contribute to a happier and more fulfilling Christmas for you and your family. Once again, if you find nothing useful in these articles, we at least hope that you accept the Race family's best wishes for a safe, happy, and blessed Christmas and New Year! 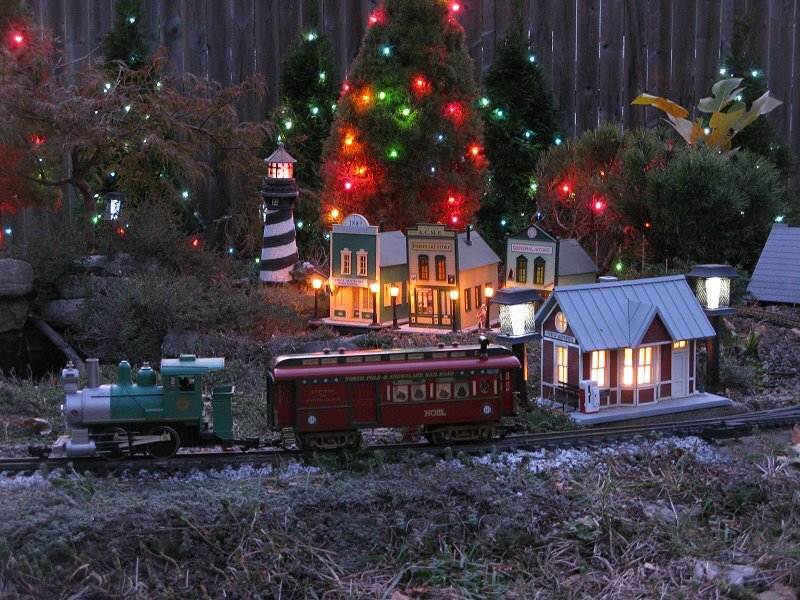 Finally, if you would like to ask questions, be notified of future open houses on the New Boston and Donnels Creek, or learn about other Christmas-themed open houses in Southwest Ohio this year please visit our 2008 Christmas Open Houses sheet. Best of luck, have a great fall and winter, enjoy your trains, and especially enjoy any time you have with your family this season. Note: Family Garden Trains™, Garden Train Store™, Big Christmas Trains™, BIG Indoor Trains™, and BIG Train Store™ are trademarks of Breakthrough Communications (www.btcomm.com). All information, data, text, and illustrations on this web site are Copyright (c) 1999, 2000, 2001, 2002, 2003, 2004, 2005, 2006, 2007, 2008, 2009, 2010, 2011, 2012 by Paul D. Race. Reuse or republication without prior written permission is specifically forbidden. 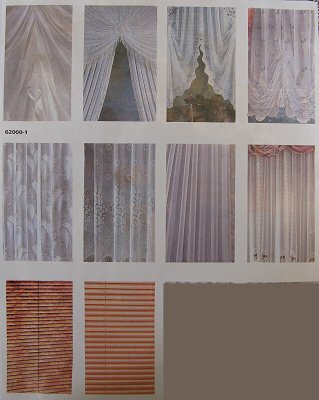 decorations that have been popular with our readers.